Anyone who has been reading the tunequest for a while knows that statistics, numbers, figures and graphs have played a large part in its progress. In fact, it was the discovery that 10% of my songs were responsible for 49% of my total play counts that prompted me to set out on this endeavor in the first place. To this day, I’m still surprised by the lack of sophisticated options available for gathering and analyzing iTunes’ stored data. That XML file has been a statistical treasure trove since the day it started recording star ratings and play counts. You’d think that in the four years since, there would be a more mature market of programs to choose from. However, 2006 has actually seen some positive developments in that regard. While there is still no killer app for iTunes stats, there are a number of solutions for parsing your XML file and learning more about your music, and yourself. There’s a new program in town (for Mac users) to help you gather more nuggets of information about your listening habits as reflected by your iTunes library. 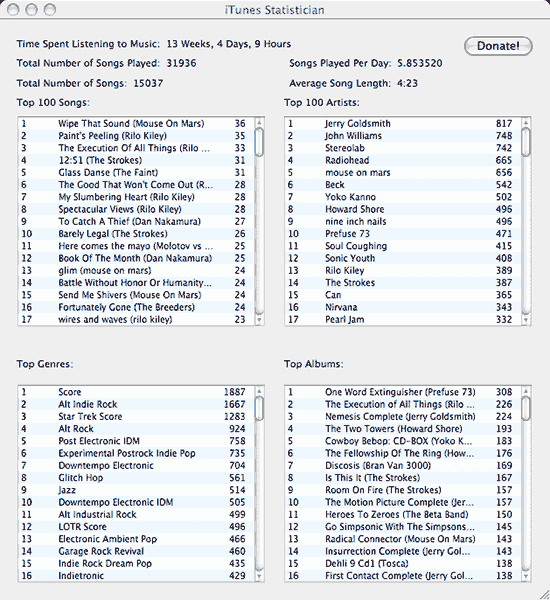 it’s a nifty little piece of donation-ware called iTunes Statistician and it analyzes your library data to calculate your top 100 songs, artists, albums and genres, based on playcounts (and optionally weights for star rating as well). additionally, it calculates the total number of plays of all your songs and tells you how much total time you’ve spent listening to your music. It also tells you the average length of your songs (4:23 in my case) and average number of songs you play each day. The program makes a pretty good desktop-based substitute to the ailing iTunes registry (which is looking to beef up its service, so kick in if you’ve got a few extra bucks). unfortunately, iTunes statistician only samples the entire library. the iTunes registry, on the other hand, allows you to submit any exported song list in XML format. In that regard, it is much more versatile. If you wanted to see the stats for all your 90s music, you’d simply create a smart playlist with condition year is between 1990 and 1999. export song list from iTunes as XML and upload it to the registry for analysis. However, until the registry is fully operational again, I’m certain that iTunes statistician will provide me with all the information I need.